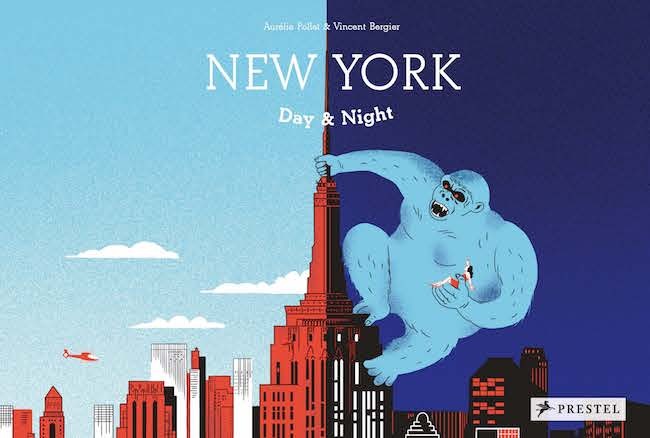 In 1971 Motown greats The Temptations sang “it’s just my imagination, running away with me.” That’s something that author Aurélie Pollet and artist Vincent Bergier set out to illustrate for youngsters with their read-along book New York Day and Night, coming next month from Prestel Publishing. As the title suggests the book offers a series of dual scenarios based on famous New York City landmarks. Each is presented in it’s normal daytime and imagined nighttime version. Transparent overlays mask parts of the daylight image thereby creating a creepy night visage with each scene uniquely morphed into an outre form of its reality. The following daytime page acts as the denouement clearing up any apprehensions. For instance, that scary giant serpent is really an elevated subway line. The number 1 train in fact. Throughout New York Night and Day Imaginative New York night scenes mask the daytime reality. Our trip around NYC is guided by two cartoon characters. Sandy the alley cat is our past dusk narrator while Frankie the city squirrel greets us when the sun comes up. Frankie chides his feline counterpart for the scenic misinterpretations, but readers may prefer Sandy’s imaginative spin on the surroundings. 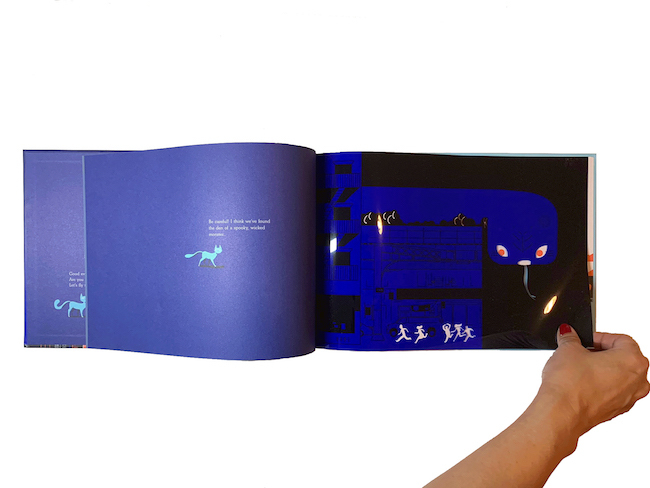 In fact, the book’s overall theme might serve as a creative kickstarter for children to emulate the day versus night tableaus with their own artwork. For New York residents it also offers an opportunity to familiarize their kids with iconic places throughout the city. Follow up visits to the sites portrayed in the book could be a fun family outing. Anyone who has visited this website over the years will already know my devotion to RKO film’s 1933 special effects masterpiece King Kong. So it’s no surprise a book cover featuring an outsize gorilla perched on the crest of the Empire State Building would get my attention. 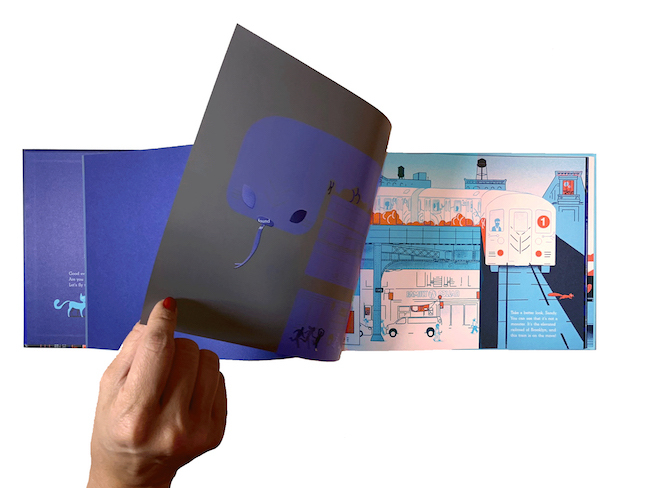 The hardcover is nicely printed in shades of blue and red. The thick intermediary overlay cells should stand up to continued handling without fear of tearing. The repeatable fun of the book’s obscured/revealed nature make it as much a play experience as a read-along and it has the potential to be a “hand me down” book which new readers may enjoy sharing with their younger siblings. Transparent cells make changing the night and day scenes a fun experience. Scary nighttime visions form a part of all our growing experiences and learning to conquer the monster-in-the-closet is a big part of moving into adolescence. I’m happy to report the headless man looming in the corner of my childhood bedroom was only my Dad’s winter coat on a clothes hanger; vanquished with the flick of a light switch.